A while ago, I started the fifth scarf I need to make for this Christmas holiday. Once my fever settled down (after 10 days) and the aches in my joints petered out as well, I was finally able to knit again. I’m having a great time finishing all these started objects and I know I’ll be done in time for the gift-giving day. Several people commented on how much they liked the ‘dewdrop’ pattern and the pretty yarn, so I thought I’d quickly write up the pattern and post it here for the taking. If you make this scarf, I’d love to see a picture of it, so in a comment, add a link to your blog, flickr, or other online photo album and share what your scarf looks like. Hace un tiempo comencé la quinta bufanda que necesito completar para esta navidad. Ya cuando se me calmo la fiebre (despues de 10 dias) y los dolores en las articulaciones desminuyeron, finalmente pude tejer de nuevo. Estoy divirtiendome mucho con acabar todos estos proyectos que llevo en las agujas desde hace un tiempo y sé que los tendré listos para el dia de regalos. Varias personas comentaron como les gustaba el punto de gota de rocío y la lana bonita, así que decidí escribir el patrón rapidito y colocarlo aquí para compartirlo. Si tejes esta bufanda, me gustaría mucho ver una foto. Favor añadir un comentario que contiene un enlace a su blog, o cuenta de album en linea para compartir tus resultados. I’ve finally designed a pattern for scarf #2. Please have a look and tell me what you think of the pattern. To see photos of the yarns I used go here. In addition, there are live links on the pdf page. Finalmente he diseñado un patrón para la bufanda #2. Favor tomar una miradita y dime lo que piensas del patrón. Si desea ver fotos de los hilos que use pulse aquí. Además, hay enlances de internet vivos en la página pdf. Si necesito correjir algo en el castellano favor avisarme cuanto antes. Gracias. I’ve finally took 5 minutes to take a picture of this mohair scarf I finished at the cottage we went to for Thanksgiving. The pattern is ‘Town and Country’, one of the Elizabeth I collection by Kristmen’s Design Studio. Knitting with this British Mohair #4 was sumptuous. I only had to tink a few times and it wasn’t as bad as the norm for mohair. The pattern was easy to memorize and it was a favourite portable project. Here is a picture of my family on a boat we rented for a morning. 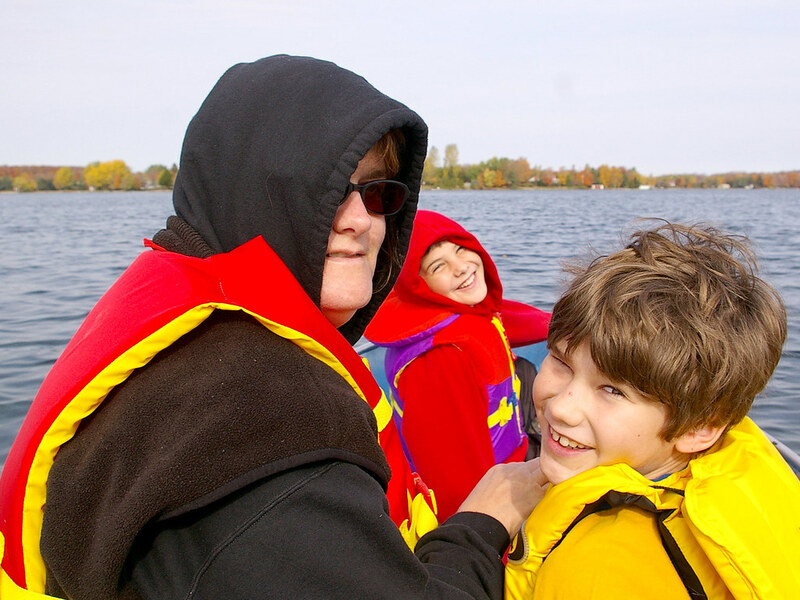 It was great to boat around the lake looking at the coloured leaves. It wasn’t where I knit however; that was while relaxing on the beach or in the cute cottage (see cottage #2) we rented. Por fin ahorré 5 minutos para tomar esta foto de esta bufanda de mohair que la completé en el ranchito donde pasamos el dia de fiesta pasado. El patron es “Town and Country”, uno de la coleccion de Elizabeth 1° por Kristmen’s Design Studio. Calcetinar con este mohair de British Mohair fue estupendo. 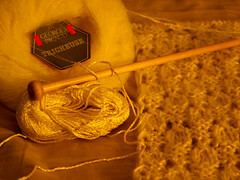 Solamente tuve que destejer pocas veces y no era lo dificil como costumbra serlo el mohair. El patron fue facil memorizar y me parecia un projecto portatil ideal. Aqui estamos en un barquito que alquilamos por una mañana. Fue genial navegar por el lago mirando a las hojas coloradad. No tuve oportunidad tejer en la nave, pero si lo hice en la playa o en la casita (ver la 2) que alquilamos. I know I posted about my fifth scarf before I ever showed you this one. 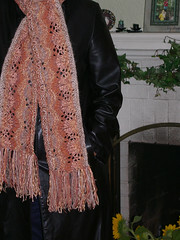 This scarf is made with the yarn I frogged from that ugly shawl I was working on a week or so ago. I’m working on size11mm needles and I have 2 strands of kid mohair, a ribbon yarn, a cotton/silk boucle, and a singleply wool tweed. As I run out of one kind/color of yarn I add a similar one in texture and colour. Esta bufanda la estoy trabajando con los hilos que estaba usando para ese chal feísimo. Con agujas de 11 mm y los siguientes hilos: 2 de mohair, una cinta delgadita, un buclé de algodon y seda, y una lana de una sola hebra con textura tweed. Al andar escaso de una de los hilos, lo substituyo con otro similar. 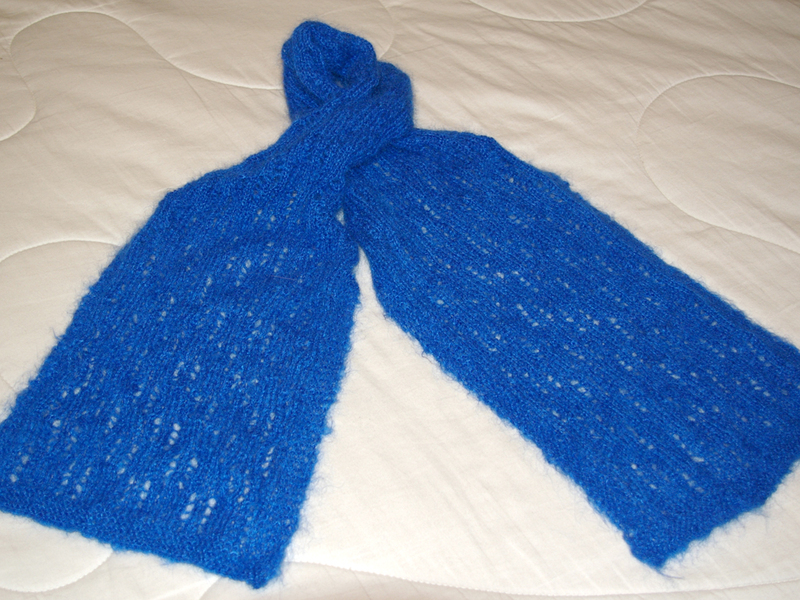 This is my fifth and final scarf project for Christmas gifts (mind you I still have scarves 3 and 4 on needles too). 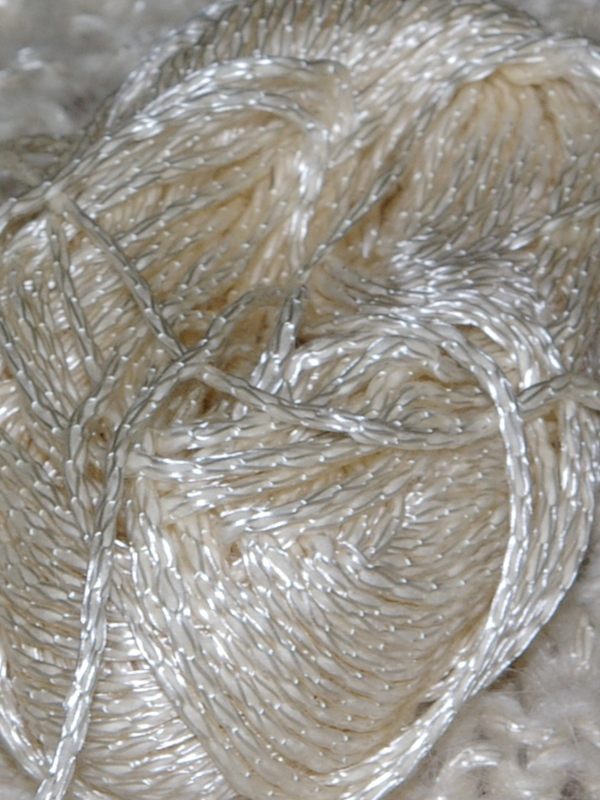 I’m using a Georges Picaud mohair and some viscose, nylon knit tube yarn from my 15-year-old stash. I don’t have a label for it, unfortunately. Does anyone recognize this yarn? Would anyone know of a similar product I could use in case I run out of the two skeins I have? 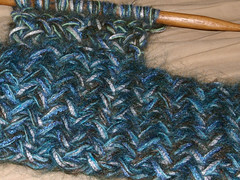 A zoomed in version of my two-way scarf (see previous post). I really like how it turned out. Una versión magnificada de mi bufanda bi-direccional (ver nota previa). Me gusta mucho el resultado. 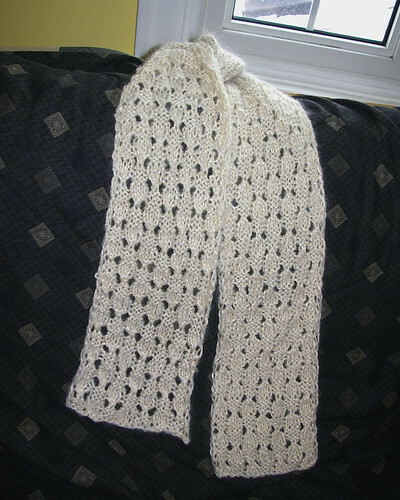 If casting on lengthwise for a scarf is not your thing, I’ve finished the pattern for another lacey scarf. You can find notes on it and the pattern here. Si bajaron el archivo pdf antes del 14 de noviembre a las 8:12 hora Bogotana (-5GMT) encontrarán errores en la versión española del patrón.